I got a new idea for my blog from a friend. She asked if she could send me some cool screenshots that she had taken. I said sure, and that I would post them on here, and that got me thinking. What if I made a monthly post featuring screenshots that you guys had sent in? I love seeing cool shots that other players take. And I figure this could be a way to get them out there so more people can enjoy them as well! 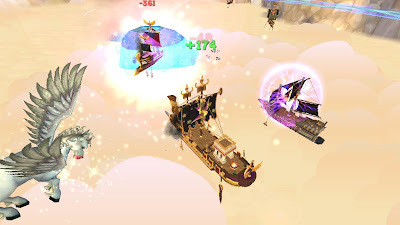 Also from Fair Christina Nightingale, a picture of fighting ships in Aquila. Before taking a screenshot, press CTRL-G to get rid of all the menus, health globes, etc. Go to settings and turn off names and increase the resolution quality. Find something that you think will be unique to take a picture of! These things aren't necessary to get your picture posted, so don't worry if you already have a cool picture that you didn't do all these things with. Have fun with it and good luck! And thanks to Fair Christina Nightingale for sending in the first 2 pictures and for giving me this idea! I can't wait to see what the rest of you send in! 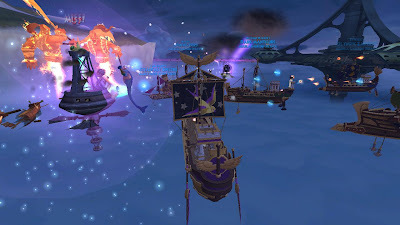 New Pirate101 Housing and More!